his armpit to assist lymphatic efficiency. There is an ancient cave drawing in Egypt that depicts two men practising reflexology on two patients, and it dates from 2330 BC. The ancient art remained in use in China, Japan, India and throughout the Eastern world but, as usual, was lost to Western medicine until the 1960s. Once we rediscovered it, we embraced it, and inevitably set up an Association of Reflexologists, but what is it and how does it work? In her talk on Saturday, 25th April, trained reflexologist (and dowser) Isobel Willmott, from South Herefordshire Dowsers, revealed that there are principal reflexes on the feet and hands that correspond to every part of the body. So it is possible to work on any part of the body by manipulating the feet or, less usually, the hands. Reflexology can be extremely beneficial, confirmed Isobel, as it encourages the body to heal itself. It balances the system, releases toxic waste, and helps blood to flow more freely, which in turn brings more oxygen to the tissues and makes us feel better. It can be a useful diagnostic tool too, although it is continually drummed into dowsers, reflexologists and alternative practitioners alike that only qualified medical practitioners can make a diagnosis. But puffiness, local tenderness, and discoloration - including redness and even yellowness - are strong clues to a patient’s physical and emotional wellbeing, and an experienced reflexologist will easily identify them. What is it good for? It is wonderful for helping you relax, so very good for stress, and 75% of dis-ease is stress related. Those suffering from MS and ME find it helpful, as do sufferers of sinus problems, digestive disorders, hiatus hernia and even infertility. Sometimes a malady will get worse before it gets better and other reactions can include a patient becoming emotional during treatment, a lowering of body temperature, feeling sleepy and, as it aids the flow of fluids, an urgent need to pop off to the loo. There are, of course, things it is not so good for, and practitioners are wary of treating diabetics, early pregnancy, those with metal rods or plates inserted surgically, and various cancers, although again it can be supportive and therapeutic for cancer sufferers in the terminal stages. 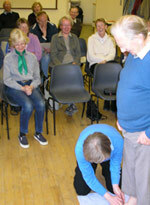 Isobel demonstrated the process on two or three volunteers, one of whom felt immediate relief in his back.